How do I audit an assessment in SpeedGrader? 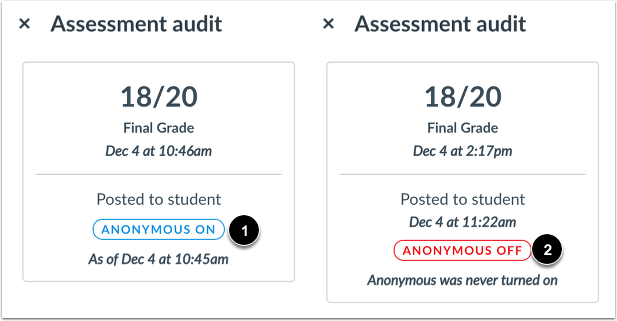 If an assignment includes moderated or anonymous grading, you may be able to view an audit log in SpeedGrader. The audit log displays all changes that affect an assignment submission. The audit log only displays once the assignment has been unmuted and may be used to verify any grading related actions. 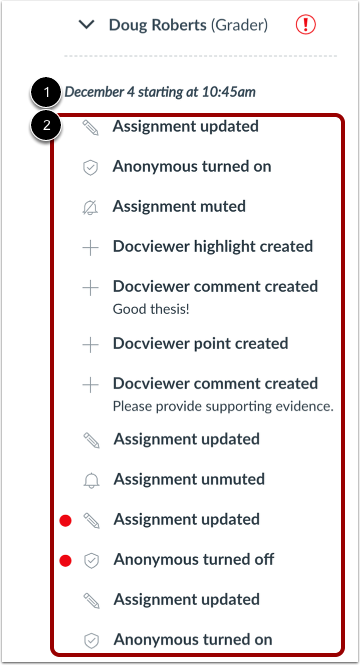 The audit log also includes information about Submission comment events, DocViewer comment events, and edits made to the assignment's settings. Auditing an assessment is an account permission. If you do not have permission to view the Assessment Audit link, your institution has not allowed you to view this feature. Assessment auditing requires an assignment to include moderated grading or anonymous grading, which are course opt-in features, and may not apply to every assignment. Open Speedgrader from the assignment or from the Gradebook. 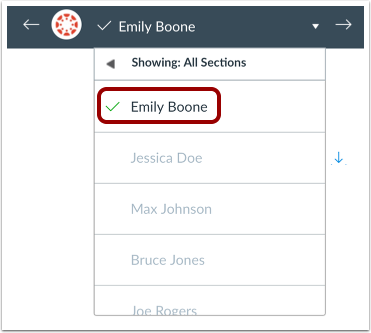 Note: If the assignment was set to hide student names, or student names were hidden in SpeedGrader settings, the student list displays all student names as anonymous. In anonymous grading, the student list order does not match the order in the Gradebook and is randomized for each assignment. Confirm the assignment is unmuted  and then click the Assessment audit link . The Assessment Audit link only displays once the assignment has been unmuted. Moderated assignments cannot be unmuted until final grades have been posted. 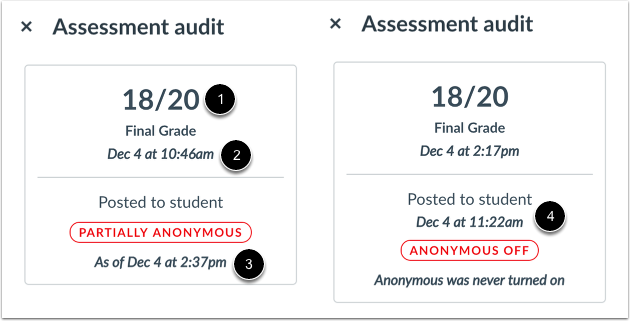 The Assessment Audit tray displays details about the submission, including the final grade  and a timestamp of when the submission was graded . 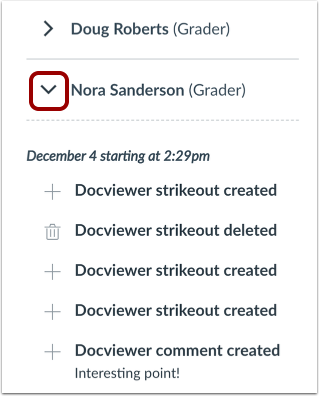 The tray displays a timestamp showing when grades for a non-moderated assignment were unmuted and posted to the Gradebook . If an assignment is moderated, the tray displays the time the grade was posted to the student . The sidebar also displays the anonymity status of the assignment. If the entire assignment was graded anonymously, the sidebar displays the Anonymous On status . If the assignment was only moderated and was not graded anonymously, the sidebar displays the Anonymous Off status . If anonymity was turned off during the grading process, the anonymity status displays as Partially Anonymous . Partially anonymous means that anonymity was turned off and back on for any of the three levels of anonymity during the grading process—student anonymity, grader-to-grader anonymity, or grader-to-final grader anonymity. 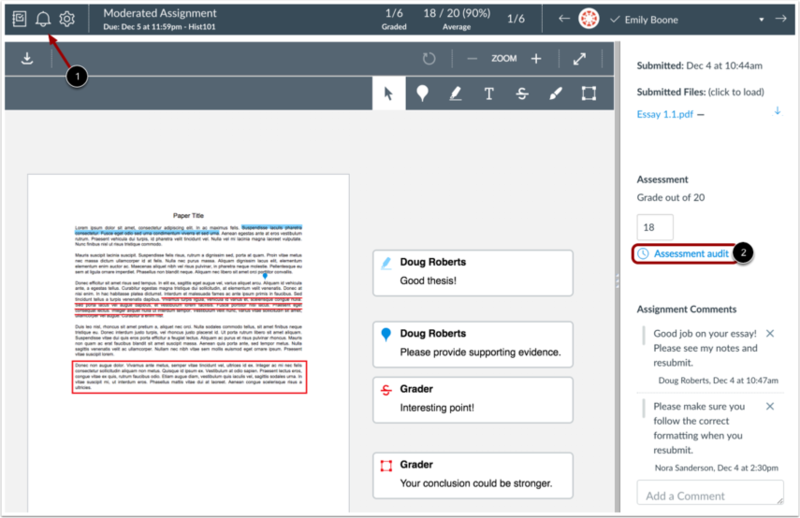 Additionally, if a grader updated the assignment at any time, the name of the grader displays an alert icon , and the audit trail displays the modified actions . If there is more than one grader for the assignment, each grader will display in the sidebar. To view the audit trail for a user, click the arrow icon next to the user's name. The event list displays the start date and time of the audit trail  and a list of events the user took while interacting with the submission . Previous Topic:How do I enter and edit grades in SpeedGrader? Next Topic:How do I use a rubric to grade submissions in SpeedGrader? Table of Contents > SpeedGrader > How do I audit an assessment in SpeedGrader? Thanks for your feedback and for sharing your idea! We're pretty excited about the updates too. If you have any questions or comments about Canvas, please let us know.